Does the world need another book about The Beatles? 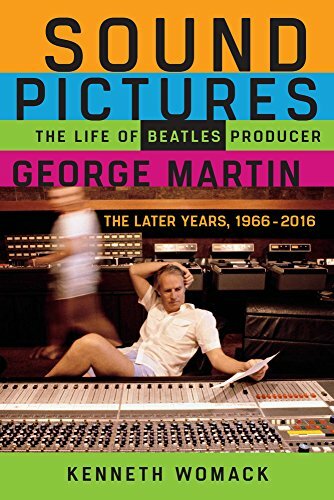 If you have to ask, then Kenneth Womack’s spirited, new book on Beatles producer George Martin, or any other book about the four Liverpool lads, is not for you. For the rest of us, the story never gets old. While Martin gets top billing, The Beatles take center stage for much of the time, which, even Martin would agree, seems fitting. When The Beatles were touring or on holiday, Martin didn’t remain idle, of course. He had other projects, other bands to oversee. This doesn’t come as a shock, yet upon learning of his non-Beatles life, you feel a little like the kindergarten student, who believes that the teacher exists only in the classroom, or in this case, only in the studio, when The Beatles need him. In fact, Martin worked with Elton John, Cheap Trick, and a host of other acts. Many of the stories here are familiar: the frenetic pace, both in and out of the studio; The Beatles’ remarkable innovations, despite the pace; the technical constraints of what came to be known as the Abbey Road Studios. More specifically, we learn about how the Beatles became enamored with backward tracks on Revolver in 1966, a process that Martin himself had played around with back in 1962; how two distinct segments of “Strawberry Fields” became magically fused; how Martin used Artificial Double Tracking [ADT] to distort John’s vocals, as John, incomprehensibly, hated his voice. Even when traversing this familiar territory, Womack manages to infuse the stories with suspense. Not exactly Apollo 13 suspense, as no lives hang in the balance, but for Beatles fans, this is gripping stuff. Since this is a book about Martin, Womack focuses on the technical challenges and the creative solutions Martin and balance engineer Geoff Emerick concoct, time and again. Many of the “solutions” Martin supplied were nontechnical. For instance, he was a master at vocal harmony. And he wrote and arranged the music for the world class musicians he happened to know and invited to the studio. Some of these musicians are forever famous for these sessions. And the arrangements, of course, are brilliant. It’s impossible to think about “Eleanor Rigby” without hearing the strings, which are influenced by Bernard Hermann, who wrote the score for Psycho. What did The Beatles think of Martin? They had affectionate, regal nicknames for him, such as Duke of Edinburgh that Martin rather enjoyed, which reflects both their high esteem of him and their slight remove. Martin was never the stern headmaster, yet he provided the steady and constant guidance necessary to get work done. During a brief illness when Martin was unable to attend a recording session, his fiancé stepped in, and the boys acted out childishly, as when a substitute teacher takes over a classroom. By the time Sgt. Pepper’s came along, Martin had become more collaborator than taskmaster, yet still a guiding force—and remained so until the troubled Let It Be sessions, when no one could save the group. The writing here may not be as lyrical as Bob Spitz’s fine book on the Beatles. But there are many gems, as when he describes the Mellotron, most famous from the opening bars of “Strawberry Fields”: “It was as if a Neanderthal piano had impregnated a primitive electronic keyboard.” And the book is not as emotionally stirring as Cynthia Lennon’s book on John. Yet Womack captures quite well the joy and exhilaration and challenges of working at Abbey Road. Given the constraints of that studio, with its strict, lab coat regimes and its four-track recording equipment, it’s all the more remarkable what four young lads from Liverpool and one regal gentleman were able to create in under a decade.